The sleep I lost getting ready for last weekend’s trip to Los Angeles along with the aftermath of jet-lag has caught up with me at last. Even though I got nine hours of sleep after a full day of teaching on Tuesday, the principle of “too little, too late” seems to apply as I woke up this morning with a sore, raspy throat: for me, the first sign of an oncoming cold. Most folks can and do work through colds, but in my case, full-blown colds almost always lead to laryngitis, and as a teacher, laryngitis is the one sickness I can’t afford to have. After spending too many winters fighting colds that developed into laryngitis then bronchitis, I’ve learned to lie low–very low–at the first sign of a cold, quarantining myself in my apartment away from germ-laden college students and imbibing as much hot soup, tea, and Vitamin C as I can swallow. Missing one day of face-to-face classes at the beginning of a cold, I’ve learned, is better than fighting the full-blown consequences for months thereafter. In the case of my online classes, calling in sick isn’t a problem; I can and do use sick days to catch up with online teaching tasks, one benefit of a job that allows you to teach in your pajamas. My face-to-face classes are a bit more problematic: at the college level, there are no substitute teachers, so if I’m home sick, class doesn’t happen. That being said, both email and Blackboard make it possible for me to communicate with my face-to-face students while I’m sick, and right now, typing feels much better than talking. Although it troubles me to cancel classes so early in the term, I’ve taught–and dealt with my laryngitis-prone body–long enough to know that we can make up next week the material we didn’t cover today…but only if I take the time and care to get well between now and then. And so today I feel like I’m submerged in my own life aquatic, soaking in plenty of fluids while I swim in warm oceans of blankets. Lying low–very low–at the first sign of a cold is a bit like diving, my body protected by a bathyspheric bubble from whatever illness is floating about. Whatever bug is out there, I tell myself, isn’t going to get in here…and I’ll wash out the initial inklings of an existing invasion through an intentional overdose of chicken soup, fruit juice, and Emergen-C. Only then, I tell myself, will I be ready to respire among the sleep-deprived, immunity-compromised, and germ-laden college students I normally share a diving bell with. 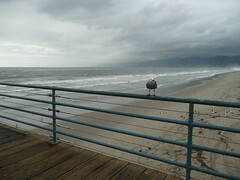 Click here for more photos from cloud-shrouded Santa Monica. 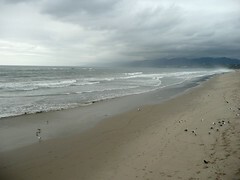 Although embarrassed locals insisted it “never rains in LA,” I myself like the moody look of cloud-covered beaches. It was mostly rainy in Santa Monica this weekend, so I returned to New England with many memories but not so many photos from a whirlwind weekend revolving around the wedding of friends. At the Friday night rehearsal dinner, Saturday wedding and reception, and Sunday morning brunch, J took hundreds of pictures, illustrating once again his skill at taking non-invasive candid shots that capture the at-ease personality of his subjects. I have no doubt his pictures will be as good and even better than those by the professional photographer who chronicled the wedding and reception. As for me, I enjoyed making new friends and keeping my camera off during the festivities, my shyness about taking pictures of people giving me ample excuse to enjoy myself rather than hiding behind a camera. 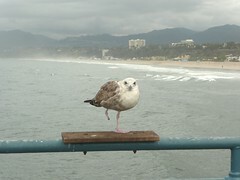 In the case of bold seagulls, though, I made an exception, figuring a one-legged bird that literally posed upon approach didn’t see my camera as an invasion of privacy. 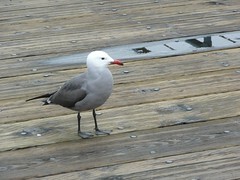 In Santa Monica, it seems even the seagulls are accustomed to paparazzi. 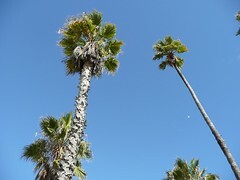 On Monday morning’s crack-of-dawn taxi ride to the airport, our driver asked if we’d seen any celebrities: apparently, a common topic of conversation in Santa Monica. “No,” J answered, “not a one,” even though several celebrities were in attendance at the wedding: family and friends of the happy couple. To J, a longtime friend of the groom’s parents, the folks in question aren’t celebrities; they’re family. So J and I kept our lips zipped while our cabbie described the time he saw Jessica Simpson and Jennifer Lopez waiting for separate rides outside the same upscale hotel. When it comes to friends who happen to be famous, it doesn’t seem fair to talk and tell. When you see the softer side of any celebrity–the groom’s famous sister tearing up as she described how happy she is that he’s finally landed with a woman who makes him happy, or a famous friend echoing the same sentiment–you realize the thinness of celebrity skin. On Friday night, I hadn’t met any of J’s LA friends; by the time the rehearsal dinner was over, they all felt like family, the congratulatory speeches and funny stories they shared demonstrating how loved and loving the happy couple truly is. I’ve been to a few non-Hollywood weddings that felt like big performances with expensive flowers, fancy finery, and gourmet meals all screaming “look at us, and be impressed.” This weekend’s wedding felt entirely different. When you are a celebrity, you don’t have to flaunt that status; when you are a friend or relative of a famous person, you know and love their unseen private side, who they really are. Equipped with that knowledge, you have no need or desire to brag. After Monday morning’s crack-of-dawn taxi ride to the airport, J and I arrived in Boston in time for Monday night’s rush hour; after spending most of Monday night grading papers, yesterday morning I left Newton at the crack-of-dawn in order to teach my 8:00am Expository Writing class here in Keene. Only when I came home from teaching a full day of classes yesterday afternoon did I feel like I’d finally landed, this weekend in Santa Monica coming so close on the heels of the start of classes and my weekend trip to Ohio. The groom’s famous sister and her equally famous husband jet-set between LA and New York, having apartments on both coasts; as for me, I belong to the Subaru-set, zipping between my workaday apartment here in Keene and my weekend home at J’s place in Newton. Is being an actor, professional athlete, supermodel, or other celebrity more exciting than teaching a handful of face-to-face classes in a quiet New England town or a couple more classes in the anonymous ether of the Internet? Or do they each offer their own challenges and satisfactions? At the wedding reception, after having met and briefly chatted with the groom’s sister on Friday night, we had a longer conversation about her in-progress English degree, something she’s interrupted every time she’s landed a movie or television role. 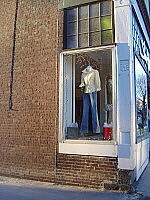 Some might envy the lives and lifestyles of the rich and famous, but as for me, I’m grateful for the peaceful obscurity of life in a quiet New England town and the knowledge that I can take (and teach) college classes without weathering the ogling stares of passing classmates and cab drivers. After learning that I teach online, the groom’s sister peppered me with questions: could online classes give her the schedule flexibility and personal privacy she needs? I suggested they might and offered to answer any questions she might have, proof that even professors have their own hungry public if not an attendant paparazzi. Celebrity skinned or otherwise, we’re all human souls underneath. 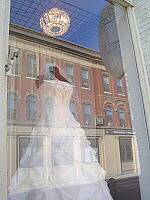 The third picture above shows the box of goodies, assembled by this company, the bride and groom provided for out-of-town guests. When ours arrived at our hotel, the desk clerk admired the packaging, and I have to say the contents were equally tasty. Soon on the heels of arriving back in New England after visiting my family in Ohio, I’m leaving again, this time for a weekend wedding in Los Angeles. Although I’ll be taking my laptop to keep in touch with my online classes, I’ll once again be out of the loop when it comes to blogging. 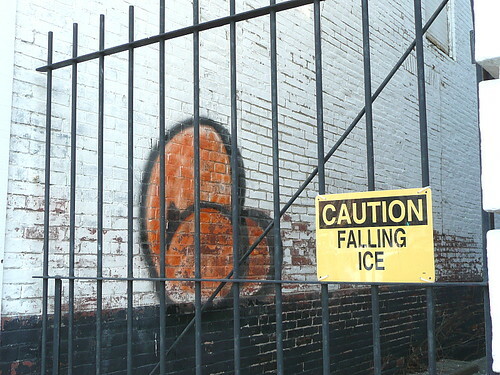 I’ll see you when I return from the Left Coast; in the meantime, watch your step and beware of falling ice. 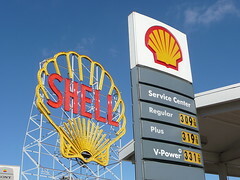 The vintage Shell gasoline sign at the corner of Magazine Street and Memorial Drive in Cambridge is (like the freeway revolt mural near the same corner) something I’ve passed countless times, both when I lived at the Cambridge Zen Center a decade ago and now whenever I return to Newton after practicing in Cambridge. 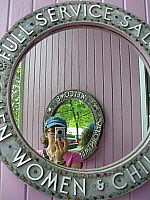 When I lived at CZC a decade ago, I didn’t have a hungry blog to feed, nor did I carry a camera with me. But now that I’ve been staying in Newton every weekend, driving to and from the Zen Center a couple times a month, and perpetually looking for quirky, blog-worthy sights, I’ve been meaning to stop and take a picture of this sign. When people think of landmark Boston signs, they immediately think of the Citgo sign in Kenmore Square, which is visible over the outfield at Fenway Park (and thus known and loved by Red Sox fans around the world). 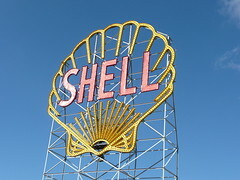 But the Cambridge Shell sign is something only a Cantabrigian would know and love. 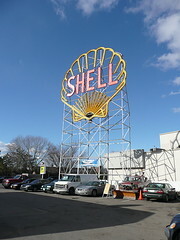 And only the People’s Republic of Cambridge (as citizens of my once fair city are wont to call her) would officially declare an old gas station sign a historic landmark even though during one point in its poorly maintained past, the sign read HELL after the neon bulbs in its initial letter burnt out. On Sunday, I’d gone to the Zen Center to give consulting interviews–a chance for me to meet one-on-one with newer practitioners and answer whatever questions they have about their practice. Consulting interviews are an optional thing. Although on retreat you’re expected to have kong’an (koan) interviews with the Zen Master, during Sunday mid-morning practice, consulting interviews with senior teachers are optional: you can opt in, or you can literally bow out. When I lived at the Zen Center a decade ago, I often skipped going to consulting and even kong’an interviews. When you live in a Zen Center, you have countless opportunities to interact with teachers, sit retreats, and otherwise immerse yourself in Everything Zen, 24/7. What need is there, you ask yourself, to go to an interview to ask questions of a senior teacher who is invariably going to tell you to practice more, keep a “don’t know” mind, and figure things out for yourself? Only after I moved out of the Zen Center did I realize how precious those (often missed) opportunities really were. When I’m in Keene, the Zen Center and the people who practice there are an hour and a half away; even when I’m in Newton, the Zen Center is a half hour away by car (and about twice that far away by T). How much easier it was, I sometimes think, when I lived in the Zen Center and could literally roll out of bed and find myself face-to-face with a Zen Master! Nowadays, I find myself in a funny position, the meditation cushions having turned. When I was sitting in the student seat, I put off going to interviews, figuring I’d have more time some other time. Now that I’m just as busy as ever (albeit with different things), I now find myself sitting in the teacher’s seat, wondering why more practitioners don’t make the time to practice, go to consulting interviews, and ask more (and more insistent) questions. If there’s one thing I’d go back and tell my younger self–if there’s one thing I’d tell the folks living and practicing at the Zen Center now who don’t think they “need” to go to interviews–it would be this: practice as much as you can while you can. Unlike a certain gasoline sign in Cambridge, your Current Condition isn’t a protected historic monument: instead, you never know when your Current Condition will change, you’ll move away, and your easy access to a thriving practice community will become much more complicated. If you knew that the picture-perfect conditions of Today were going to change Tomorrow, would you make a point to do all the things you’ve been putting off? 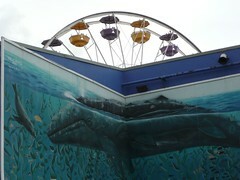 Impermanence surrounds us, protected landmarks notwithstanding. If we don’t take pictures, go to practice, or ask questions now, what exactly are we waiting for? There’s feral furniture, and then there’s smashed furniture: the innocent, castoff victim of some anonymous party’s uncontrolled anger issues. 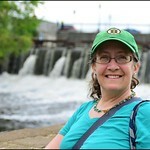 I snapped this photo in Cambridge on my way home from the Zen Center on Sunday. 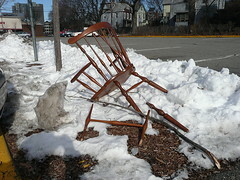 I’d stopped in the bitter cold to photograph something else then was struck by the poignancy of someone else’s smashed chair. There but for the fruit of Zen practice go I.
Blogging has taken a temporary backseat to other demands: today is the first day of classes at Keene State, I’m getting ready to go to a west coast wedding this weekend, and my online classes are solidly settling into the stride of their eight-week term. Life is busy, but busy is good. Being busy pays the bills, being busy keeps me out of trouble, and being busy leaves me no time for unnecessary crack-ups. No sooner do I get home from Ohio, it seems, but it’s nearly time for me to go back to school: another example of time slipping out of my fingertips. In one sense, I’ve already been back to school for more than a week. My new online term started last Monday, so two classes of students and I are well into the second of our eight weeks together. But for me, “back to school” refers to face-to-face classes, and those resume next week. In the meantime, I’m trying to figure out where half of December and January have already gone. What happened to the long winter break I’d looked forward to during a busier-than-usual fall semester? Time has a way of slipping away regardless of the traps and snares I set in its path. Yesterday I sat down with my Book of Lists–the notebook I use to organize teaching and other mundane tasks one to-do list at a time–and made the first set of lists for the new semester. For each day, a page; on each page, a list. Today, tomorrow, and the day after: here are the tasks, chores, and errands I have to do between now and then. I have almost an entire book filled with such lists, and time slips away still. Do you know how many times I’ve lamented in occasional scribbled journal entries (some kept in the Book of Lists, and others elsewhere) about how I need to “tame time” through more efficient list-making, scheduling, and other time-management techniques? Despite all my organizational tips and tools, time refuses to slow for me. No matter how many times I make my lists and check them twice, time still continues to fly. Time, I’ve decided, is a wily creature that delights in wriggling from our grasp, creeping away into any tangle or thicket where we with our calendars, to-do lists, and time-lines cannot follow. Yesterday as I made yet another set of lists and noticed how my current Book of Lists is nearly full, I wondered whether I should keep it once I’ve moved onto its successor. I keep my journals–I have a portion of my bookshelf where they stand numbered and dated as they keep the time written within their leaves. How much more indicative of my days, I thought, is each day’s to-do list with its assortment of tasks Done and Still Undone? They say Saint Peter stands at heaven’s gate with the Book of Life, a list he checks for the souls of the saved, their names appearing like a entries in a maitre d’s reservation book. Isn’t Saint Peter’s book merely a mythic version of my own Book of Lists, a whole lot of lives chronicled in his while mine keeps track of merely one? 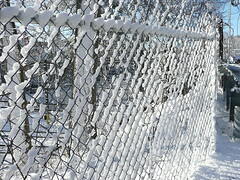 Time can’t be tamed, but it can be tracked, noted with each line-item like a snow-stamped footstep. Where have my days gone, and what (if anything) did I accomplish with them? Only the Book of Lists knows, if I dare page back and double-check the checked. 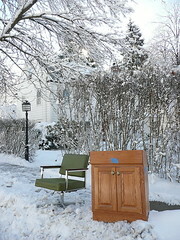 The second photo in this entry is intended as a visual reminder that even in the snowy wintertime, furniture sometimes chooses to go wild. Yesterday morning I asked my parents to drop me off early at the airport in Columbus, Ohio so I could catch up with some online teaching tasks while waiting to fly back to New England. 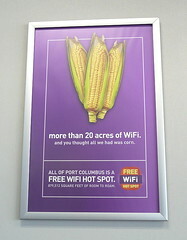 Whereas you have to pay to connect to the wireless network at Boston’s Logan Airport, the wifi at Port Columbus is free. 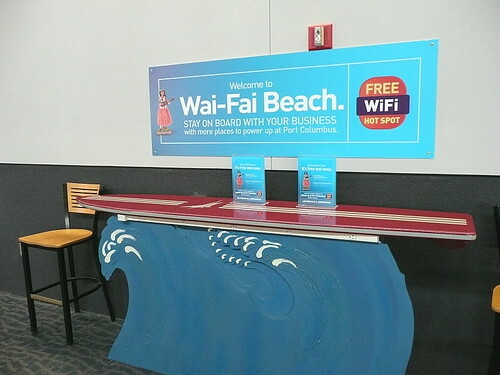 After spending a couple hours surfing the online waves at Wai-Fai Beach, I caught up with my students’ Discussion Board posts and turned off my laptop just in time to board my flight. Goodbye, Columbus; hello, New England. Hello New England indeed. I’d planned to return to Boston on Sunday afternoon so I’d be here (and back in touch with my own wifi connection) in time for Monday morning, when a new week’s worth of online assignments goes live. Monday morning is when I post new Discussion Board forums, check that my Lecture Notes and Discussion Questions have posted, and download response papers from the previous week. In other words, Monday morning is when both my online students and I are gearing up for a new week, and doing that via dial-up is slow going. Flying during a Monday morning snowstorm can be slow going, too, so I arrived back in Boston yesterday afternoon in the nick of time, before the sky starting dropping nearly a foot of snow around midnight. 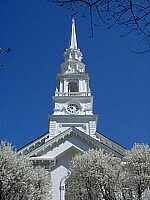 Yesterday morning was cold and clear in Columbus; yesterday afternoon was similar here in Newton. Last night as J and I walked the dogs and then later walked to and from dinner at our favorite Chinese noodle house, the streets and sidewalks were bare after nearly a week of unseasonably mild weather. “Take one long, last look at the ground before tonight,” I told J, “because we won’t see it tomorrow. And true to forecast, this is what we woke up to. 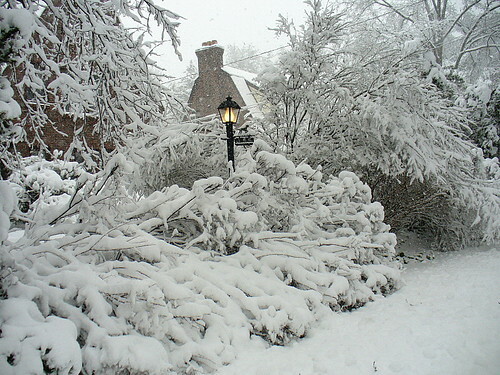 Coming home to New England right before a big winter storm means you can hunker down with your own laptop, Internet connection, and cup of cocoa while the snow accumulates in heavy clumps. I walked Reggie this morning like usual but haven’t been anywhere since. The downside of teaching online is you have to take your laptop (and rely on molasses-slow dial-up Internet access) when you visit family for the weekend; the upside of teaching online is you can stay at home on a snowy day as long as the power holds and the Internet doesn’t die. 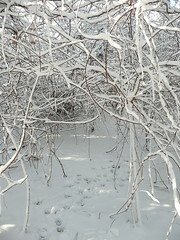 For those of you who don’t have loads of snow of your own, here’s a photo set where you can get your (virtual) fill. Enjoy!